Home > Types of Vitamins > What Does Vitamin A do? While zesty vitamin C and skin-loving vitamin E tend to grab most of the spotlight when it comes to looking after ourselves their fellow antioxidant vitamin – vitamin A – is also worth a second thought. So what does it do for your body and where can you find good sources of vitamin A? Vitamin A sometimes goes by the name retinol. It is essential for supporting your vision, skin, healthy bone growth and your immune system. As an antioxidant vitamin A helps skin to repair, stay moist, and produce the enzymes that stabilise the production of collagen. As such, it is often added to skin creams, sometimes going by the name stabilised retinol. If you’re after strong, silky locks, you’ll want to remember that vitamin A is also good for your hair. What are Good Sources of Vitamin A? Though most of us think immediately of carrots when it comes to vitamin A, there isn’t actually any vitamin A in carrots. But, along with other yellow and orange vegetables, carrots contain beta-carotene, which your body can turn into vitamin A.
Vitamin A is found in liver, full fat dairy products, spinach, broccoli, tomato juice, peppers and watercress. A good tip to remember when thinking about vitamin A is to look out for orange things! Mango, dried apricots, butternut squash, carrots, sweet potatoes and pumpkin all contain either vitamin A or the beta-carotene that becomes vitamin A inside your body. 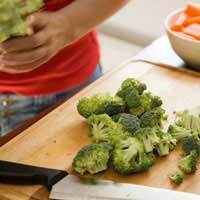 Cook your veg like carrots, broccoli and spinach very lightly – or eat them raw – for maximum vitamin intake. Vitamin A is an antioxidant vitamin, so it works hard destroying the cell-damaging free radicals in your body, helping to keep you looking and feeling young. So how does vitamin A contribute to such an important job? As we age our skin, eyes, joints and even our internal organs all become less efficient. Wrinkles appear and our complexion loses its youthful glow. It’s just a fact of life. But what causes our bodies to break down in this way? One major cause is the existence in our bodies of free radicals. Free radicals are naturally produced by our bodies, and we make even more of them when we’re subjected to stress, when we eat poorly, or when we’re exposed to pollution or cigarette smoke. In fact, many aspects of modern life encourage our bodies to manufacture more of these damaging free radicals. They then float around our bodies contributing to the damage and ageing of our organs, the visible ageing of our skin and sometimes even triggering disease. But help is at hand. Antioxidants destroy free radicals, helping us stay younger and fitter for longer. Although it’s a good idea to have a healthy intake of vitamins every day, avoid thinking that taking high doses of vitamins must be super-good for you. Taking high doses of vitamin A is not a good idea. For example, vitamin A encourages your cells to reproduce, which is normally a good thing. But if you take too much vitamin A the cells in your hair follicles could go into overdrive. This means each hair reaches the end of its growth phase more quickly and falls out. Your body can’t make new hair quickly enough to replace the speedy ones that have gone and the result can be thinning hair. But the side-effects of overdosing on vitamins can be more serious than embarassing hair loss. Exceeding the recommended daily allowance, or RDA, of vitamin A can cause health issues. Vitamin A is stored in the liver, so regularly consuming far too much vitamin A can lead to liver problems. Don’t panic though, this doesn’t mean that just because you’ve eaten a lot of food containing vitamin A that you will immediately have problems. It’s consistently taking more than the RDA of any one vitamin that should ideally be avoided. It’s also best to avoid taking vitamin A supplements while you’re pregnant, as this may damage the development of your baby. Always check with your doctor before taking any supplements during pregnancy. As is usually the case with vitamins, the best way to ensure you get enough vitamin A is to eat a healthy, balanced diet, full of fresh fruit and vegetables. If you do this, you’re unlikely to need vitamin supplements. So think about orange fruits and veg next time you’re out shopping, chop some dried apricots over your breakfast cereal, or even spread a little pate on your toast. There are plenty of healthy and delicious ways to get enough of this essential nutrient. how old are you people!!!!!!!! Awesome blog! Your blog post is really very informative. I was not aware about that much of benefits “vitamin A” in our daily life. After reading your blog, I have found many good things. Thanks for sharing it. h a ave a chronic eye disorder called unvietis it's in my right eye I can barely see out of itat all. The eye doctor my will slowly come back but I dont think so. My friend told me to get vitamin A and that it is good for the eyes we will c.
i love drinking freshly juiced carrots. This is a good site and very helpful, thank you! !